Learn how to use an effective technique called parallel harmony to create musically obscure chord progressions from melodies. Parallel harmony is an effective technique commonly used in electronic music to create unique chord progressions and melodies. Chord progressions made of parallel harmonies retain the same note structure when moving from one chord to another. Unlike traditional progressions that often move between major and minor chords, the parallel movement of each note in a chord moves by the same number of semitones all in the same direction. For example, to create a chord progression using parallel harmonies you could copy the same chord several times and then transpose each chord up or down in the series to build a sequence. This technique defies music theory in a way because many notes in each chord may play outside the key your working in. However, when done correctly, parallel harmonies can be musically pleasing. Early and modern house music is an excellent example that captures the distinct sound of chord progression created from parallel harmonies. A common technique used to recreate a classic style heard in house music is to take a single chord sample and play it like a melody at different pitches. The resulting harmony moves in parallel because the chord structure is recorded into the sample, and when you transpose the sample up or down all the notes that make up that chord move by the same number of semitones. This method creates a dissonant sound at times that is commonly heard in house music. Let’s explore parallel harmony further by building a chord progression from a melody. 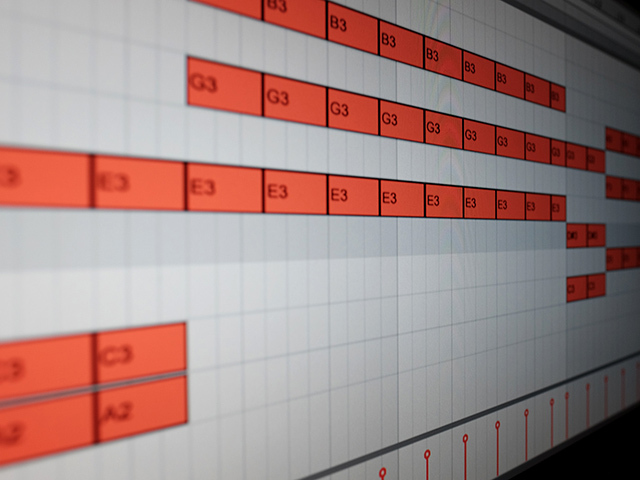 Let’s begin by creating a single melody line in the key of G major using Ableton Live. A crafty way of working with only the notes in a specific key within Live’s piano roll is to write in the notes for a scale and then activating the ‘Fold’ button to hide all rows that do note have MIDI notes leaving only the notes you wish to work with. Now that we are familiar with the notes that make up a G major scale let’s work out a melody. There are several ways to write good melodies, try playing around with different note placements or even try singing a melody out loud and then do your best to work out what notes you were singing. Since a lot of electronic music is loop based, it’s important to resolve a sequence before it begins to repeat itself. This is important when creating good melody and chord progressions that flow and transition well. Check out a previous tutorial ‘Tips for Better Chord Progressions‘ to learn more about resolving phrases. An effective way to signify the end of the progression is to end the phrase on the same note it began with to create a sense of completeness. Using other notes and chords outside the key you’re working in creates varying degrees of tension that may sound incomplete or awkward. Resolving progressions using the same chord or note you started with will likely sound more pleasing and will transition better when looping phrases. This basic technique reinforces the tonic or tonal center of your melody. Now that we have a solid melody let’s use the notes to begin building chords. Each note will be the root or tonal center for our chords. Our goal is to create parallel harmonies, so we need to choose only one type of chord, major or minor and then apply the same structure to each note of the melody. Let’s choose minor chords, since a majority of electronic music is written in a minor key. A quick way to achieve this in Live is to select all the notes, hold ‘Option’ and drag all the notes up three semitones and then again seven semitones to create minor triad chords. Another clever way to create chords in Live is to use the ‘Chord’ MIDI device. Simply choose the number off semitones relative to the incoming MIDI note to build a chord. This method works great for creating parallel chords. The resulting phrase may sound a little jarring at first, but it works musically. To test your ears and this theory, try transposing the second line on the fourth chord up one semitone to create a major chord. You should quickly notice how that chord does not work with the others. There’s a little confession to make, the melody and chord progression used as an example comes from Julio Bashmore‘s track ‘Battle For Middle You’ out on PMR Records. Check it out. I love those music theory tutorials. Please don’t stop making them ! All around great tutorial. Learned a bunch. Keep the theory stuff comming! Another tip for easily creating parallel harmony is to use “chord generation” tools like Ableton Live’s Chord MIDI effect. Since these tools simply add one or more notes at a fixed interval from the played note, the generated chords will always be parallel to one another.